Pete is no stranger to the club , known not only as a multi instrumentalist and singer from Coventry but throughout this country and beyond. Tonight he is joined by Mick Bisiker on vocals, guitar and bouziki. 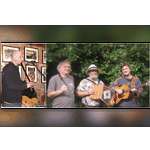 Martin Trewinnard on concertina, whistle, flute and vocals and Ewan Cameron on bodhran, flutes and guitar.